Besides being some of the most enthralling avians that exist on earth today, hummingbirds are also tiny powerhouses of motion and energy. Belonging to the family Trochikilidae, these minute birds are found exclusively throughout the Americas and the Caribbean, and they vary richly in appearance. Between 325 and 340 unique species of hummingbirds have been observed to date, with nine major branches described that separate species depending on size and coloration. South America (the Andes Mountains in particular) boasts the most diverse population of hummingbirds in the world, since environmental conditions are particularly favorable for hummingbirds on that continent, sometimes allowing for up to 25 different species to successfully co-exist in the same region. There are also around 12 species that summer in North America, but migrate to more tropical regions across the Gulf of Mexico in cold weather. Their name, of course, originates in the humming sound created by the beating of their wings, which can flap at rates that average an astounding 50 times per second – so fast that the human eye can’t even hope to clearly observe their wings while flying, never mind discern individual wing beats. These feathered little fliers can typically range in size from 7.5–13 cm (3–5 in), though the smallest species, the bee hummingbird, weighs in at less than 2.5g. Hummingbirds are no slouches when it comes to speed, either, in spite of their diminutive size. With lightweight, hollow bones, a heart that beats well over 1000 beats per minute and tremendous wing power, they can hover in mid-air, or fly forwards and backwards at speeds faster than 54 km/h (34 mph), which is faster than a pro cyclist. In fact, a hummingbird’s consumption of oxygen per gram of muscle is around 10 times higher than a professional human athlete. In addition to the fact that these little birds never seem to take a break, they’re also beautiful to watch. Many species also have extraordinary iridescent and multi-hued plumage, making them seem like small airborne jewels as they zip back and forth through the air. Although some may live to 10 years and beyond, outside of captivity the average lifespan is approximately 3-5 years for the most studied species. 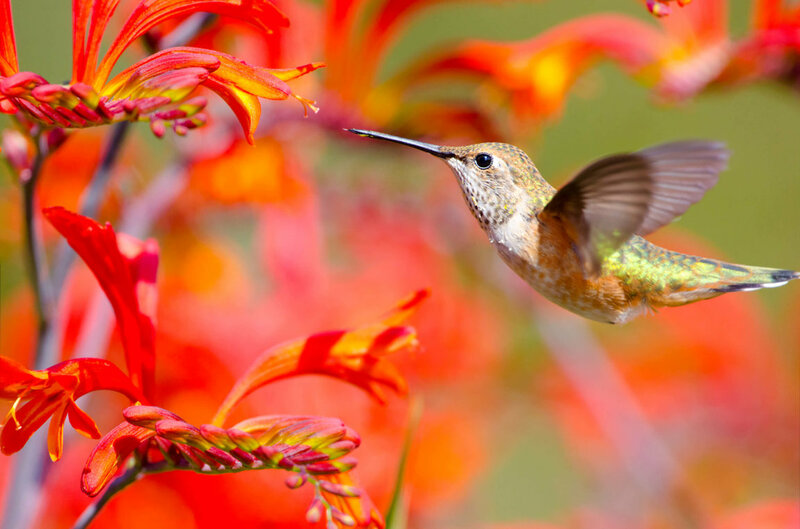 Hummingbirds must rely on flower nectar to fuel their immense energy needs, as they have one of the highest known metabolisms among all animals, with the exception of some insects. They can feed from a variety of different flowers. Some species, like the sword-billed and sicklebill hummingbirds, have co-evolved with specific flower types, developing specialized anatomy to more efficiently extract nectar from those particular flowers. Their tremendous metabolism requires them to visit hundreds of flowers every day just to survive, and they need to consume more than their own weight in nectar each day to simply live through each night without starving to death. Without a ready food source (such as during the night), a hummingbird enters a hibernation-like state called torpor, slowing its metabolism to keep their energy reserves from becoming dangerously low. Their heart rate, breathing rate and body temperature slow down dramatically at this time. The process of actually obtaining nectar (which is a mixture of glucose, fructose and sucrose) requires some specialized anatomy on the hummingbird’s part. Different species may have long, short, or even curved bills as an adaptation to allow them to extract nectar from differently shaped flowers. The two halves of the bill overlap, opening slightly to allow the tongue to extend into a flower’s interior in order to collect nectar. A hummingbird will drink by rapidly lapping up the nectar, trapping it in small tubes that run down the side of the tongue. Although this liquid gold is a phenomenal source of easily accessible energy for these pint-sized avians, it doesn’t contain many other nutrients, so hummingbirds will supplement their liquid diet with in-between meals of spiders and other insects. In spite of their reputation for constant movement, hummingbirds actually spend the majority of time between meals perching or resting to conserve energy as much as possible. Hummingbirds reach reproductive maturity anywhere between 2 months and 1 year. While some species may be fairly territorial, chasing off interlopers near a preferred food source, some hummingbird males are protective of potential mates as well. In some species, the males use feather sonation (a vibration of the feathers) to produce a high-pitched sound that catches the attention of interested female hummingbirds. Like other birds, they lay and incubate eggs tin nests, which are typically attached to leaves or branches. It’s not unusual for them to use spider silk or lichen to help build the nest (which is typically tiny and cup-shaped) and bind the structure together, and the silk allows the nest to expand as the chicks grow. Most clutches are no more than 1-2 eggs in number, and incubation can last anywhere from 14-24 days, depending on the species, temperature, and amount of care the female provides for the eggs. The nestlings are fed exclusively by the female hummingbird, who catches small insects and spiders and regurgitates them, along with nectar, into the crop of her chicks. Male don’t generally participate in nest construction or care of the nestlings. In the past, the hummingbird’s bright plumage often made it a target for those looking to sell feathers as decoration, but these days, increased agricultural practices and habitat destruction are the biggest threats on the horizon for these little birds, particularly since many species are specifically adapted to their own unique region. Climate change is a big issue for hummingbirds as well, since changing weather conditions affect the migration patterns of many species. This can cause them to travel outside their normal habitat range, where it can be tremendously difficult for them to find enough food. There are several species of hummingbird noted as vulnerable or endangered on the IUCN Red List.